Dan Brown’s fictional novel (emphasis on fictional) The Da Vinci Code insists that Jesus was married and that he had a child named Sarah with his wife Mary Magdalene. Such a theory is hardly unique. Several Mormon leaders insisted that Jesus was married, but like Brown, none of them offered any more than pure conjecture to support such a claim. Unlike Brown, LDS leaders have gone on record saying Jesus was not only married, but that he was a polygamist as well! “How was it with Mary and Martha, and other women that followed him [Jesus]? In old times, and it is common in this day, the women, even as Sarah, called their husbands Lord; the word Lord is tantamount to husband in some languages, master, lord, husband, are about synonymous… When Mary of old came to the sepulchre on the first day of the week, instead of finding Jesus she saw two angels in white, ‘And they say unto her, Woman, why weepest thou?’ She said unto them,’ Because they have taken away my Lord,’ or husband, ‘and I know not where they have laid him.’ And when she had thus said, she turned herself back, and saw Jesus standing, and knew not that it was Jesus. Jesus saith unto her, Woman, why weepest thou? whom seekest thou? She, supposing him to be the gardener, saith unto him, Sir, if thou have borne him hence, tell me where thou hast laid him, and I will take him away. Jesus saith unto her, Mary. She turned herself, and saith unto him, Rabboni; which is to say, Master.’ Is there not here manifested the affections of a wife. These words speak the kindred ties and sympathies that are common to that relation of husband and wife” (Journal of Discourses 2:81). “Now there was actually a marriage; and if Jesus was not the bridegroom on that occasion, please tell who was. If any man can show this, and prove that it was not the Savior of the world, then I will acknowledge I am in error. We say it was Jesus Christ who was married, to be brought into the relation whereby he could see his seed, before he was crucified” (Journal of Discourses 2:82). Answering Hyde’s specific question is difficult because scripture gives no indication about who was married on that occasion in Cana. Since Mary, the mother of Jesus, was somehow involved in the preparation, it has been surmised that it could have been a relative, but no concrete evidence is available. One thing is certain, though; this could not have possibly been the wedding of Jesus. John 2:2 makes it abundantly clear that Jesus and His disciples were invited to this event, and since Jewish grooms are not usually invited to their own wedding, it is ridiculous to agree with Hyde’s very flawed assumption. It appears that Hyde’s teaching was readily accepted by the LDS leadership. We find no record of Hyde being admonished for teaching such a notion. In fact, when Brigham Young took the stand after Hyde spoke, he remarked, “We have had a splendid address from brother Hyde, for which I am grateful. I feel in my heart to bless the people all the time, and can say amen to brother Hyde’s last remarks” (Journal of Discourses 2:90). “I discover that some of the Eastern papers represent me as a great blasphemer, because I said, in my lecture on Marriage, at our last Conference, that Jesus Christ was married at Cana of Galilee, that Mary, Martha, and others were his wives, and that he begat children” (Journal of Discourses 2:210). “One thing is certain, that there were several holy women that greatly loved Jesus — such as Mary, and Martha her sister, and Mary Magdalene; and Jesus greatly loved them, and associated with them much; and when He arose from the dead, instead of showing Himself to His chosen witnesses, the Apostles, He appeared first to these women, or at least to one of them — namely, Mary Magdalene. Now it would be natural for a husband in the resurrection to appear first to his own dear wives, and afterwards show himself to his other friends. If all the acts of Jesus were written, we no doubt should learn that these beloved women were His wives” (The Seer, p.159). “Evening Meeting. Prayer By E Stephenson. Joseph F Smith spoke One hour & 25 M. He spoke upon the Marriage in Cana at Galilee. He thought Jesus was the Bridgegroom and Mary & Martha the brides. He also refered to Luke 10 ch. 38 to 42 verse, Also John 11 ch. 2 & 5 vers John 12 Ch 3d vers, John 20 8 to 18. Joseph Smith spoke upon these passages to show that Mary & Martha manifested much Closer relationship than Merely A Believer which looks Consistet. He did not think that Jesus who decended throug Poligamous families from Abraham down & who fulfilled all the Law even baptism by immersion would have lived and died without being married.” (Wilford Woodruff’s Journal 8:187, July 22, 1883, spelling left intact). To my knowledge there is no evidence to indicate that Woodruff disagreed with Smith’s comments. Woodruff and Smith later became Mormonism’s fourth and sixth presidents. Was this just a nineteenth century Mormon notion? Not entirely. 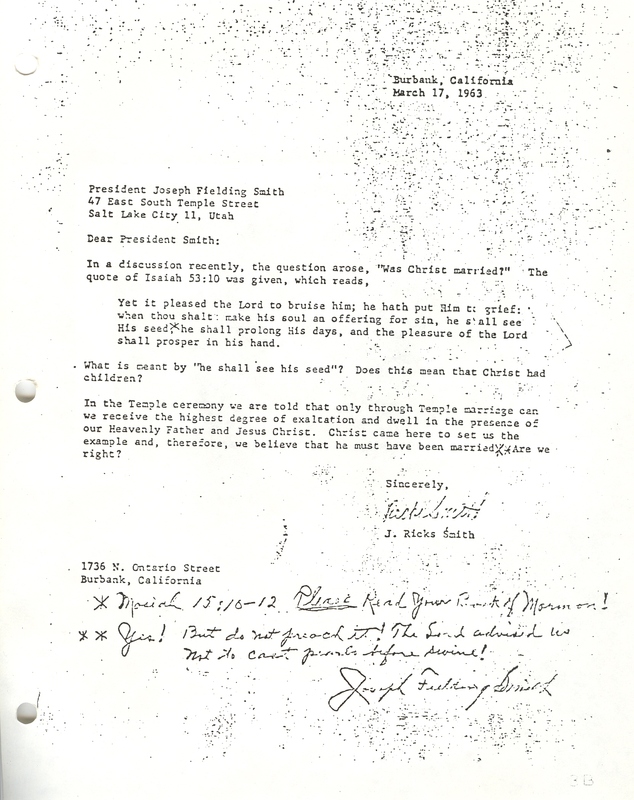 In a letter dated March 17, 1963, Joseph Fielding Smith was asked if the phrase “he shall see his seed” mentioned in Isaiah 53:10 meant that Christ had children. In the letter it also mentioned that “only through temple marriage can we receive the highest degree of exaltation and dwell in the presence of our Heavenly Father” and since Christ came to set an example, is it correct to assume that Jesus was married? When Smith responded to this letter, he held the position of an LDS apostle. He would later become Mormonism’s 10th president after the death of David O. McKay in January of 1970. Rather than retype the inquirer’s questions, Smith handwrote his reply at the bottom of the letter. To the first question he gave a reference from the Book of Mormon, Mosiah 15:10-12, admonishing the inquirer to “Please Read Your Book of Mormon!” The contexts of these passages do not say that Jesus had children. Instead it implies that Jesus’ seed are those whose sins Jesus has borne. However, Joseph Fielding Smith answered the second question (Was Jesus married?) by writing, “Yes! But do not preach it! The Lord advised us not to cast pearls before swine!” Underneath his reply bore the signature of Joseph Fielding Smith. Such a disclaimer once again exposes the duplicity of the LDS Church. Mormons often boast that their church is a restoration of the New Testament model. They also claim to have men who are called by God to instruct the LDS membership in teachings that are allegedly true. Yet, when they are confronted with embarrassing comments from these leaders, this same church distances itself from such remarks. Notice I said distance and not denounced. Nowhere does Bills say that such teachings are not true; rather, they just aren’t “official.” This is, dare I say, the official way the Mormon leadership gets itself out of awkward jams. The problem is, as I have often said, the LDS Church cannot supply a definition of the word official that has been consistent throughout its history. Still, we have enough information from church manuals to show that Bills’ statement is certainly misleading at best. Is Bills being totally honest when he relegates these teachings to mere opinion? No, he isn’t. Notice again the date of Orson Hyde’s first comment above. Hyde’s talk was given on October 6, 1854, in general conference. Conference is held twice a year and addresses given at these events are not taken lightly by most Latter-day Saints. Fifteenth President Ezra Taft Benson even referred to them as a member’s “marching orders” for the next six months (Teachings of Ezra Taft Benson, p. 335). Modern Mormons are told that “the inspired words of our living prophets become scripture to us. Their words come to us through conferences, the Liahona or Ensign magazine, and instructions to local priesthood leaders” (Gospel Principles, 2009 ed., p.48). If Mormons are to expect inspired words from their leaders in general conference today, why wouldn’t they think that was true for members in the 19th century? Consider also that the quotes supplied above are statements from very prominent members of the LDS Church leadership, three of whom would go on to become Mormon prophets. Is Bills really trying to imply that these men were speaking irresponsibly? I don’t believe that at all. This is just another case of the LDS Church hiding behind words and counting on an ignorant public. If we had three apostles agreeing on a specific teaching in the New Testament, it can be certain that it would, without question, be considered Christian doctrine. “the story of the plan of life and salvation which was instituted by our Heavenly father and His Only Begotten Son in the spirit world before man was placed upon the earth; and it discusses the revelations of eternal truths from Adam’s day forward” (Preface, p.vii). On page 18 of The Gospel Through the Ages it lists the “Gospel Ordinances” that must be practiced by “the sons and daughters of God” if they hope to get back into the presence of God. “Such ordinances as baptism, confirmation, temple ordinances, priesthood ordinations, marriage, and others, are all part of the Gospel plan of Salvation” (emphasis mine.). On the following page it states that “Jesus Christ, the only perfect man who has lived on this earth, was perfect because He obeyed all the principles and ordinances of the Gospel in order that He ‘might fulfill all righteousness'” (emphasis mine). If that is so, then Bills is misleading the public when he relegates the above comments to mere opinion. “Prophets have the right to personal opinions. Not every word they speak should be thought of as an official interpretation or pronouncement. However, their discourses to the Saints, and their official writings should be considered products of their official prophetic calling and should be heeded” (Teachings of the Living Prophets, p.21. Emphasis mine). Are we to assume that the LDS leadership and its PR department don’t read their church’s manuals? Or are we to assume that they hope the membership doesn’t? One thing is abundantly clear and that is the LDS Church is of often guilty of teaching two messages — one for the membership and one for the general public. May our Lord expose this duplicity and in doing so cause Mormons everywhere to see that their church has no intention of being truthful when it comes to its teachings or history.